It’s amazing how some foods seem to pair so perfectly with certain events – like that box of popcorn in the movie theater, the candy apples on a stick at the carnival, or the big tower of cake at any wedding. For many sports fans no gathering is complete without a batch of Buffalo Wings within the food mix. But with all that saturated fat and salt, traditional Buffalo wing recipes can be far from heart-healthy. The star of the table at your next sporting get-together. 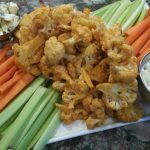 This Buffalo Cauliflower recipe gives you the best of both worlds – a spicy, flavorful treat that is also more heart-friendly. There’s much less saturated fat (especially if you leave out the butter entirely), it’s and lower in sodium than traditional Buffalo wings. It’s also nice to have a homemade buffalo sauce on hand of which all of it’s ingredients you can pronounce. I like to serve this dish with typical Buffalo wing sides: raw carrot and celery sticks and a bit of crumbled blue cheese. But even all on its own, this Buffalo Cauliflower is quite tasty. The Chili peppers give it a really nice heat. If you want, make the Buffalo sauce ahead of time. Store it in a sealed container in the fridge for up to 6 days. Also, for this recipe you will need to use only about 1/2 of the sauce. So, there will be plenty leftover to turn just about anything Buffalo throughout the week! Toss the extra Buffalo sauce with more roasted cauliflower, or with chicken breasts, shrimp or tofu, or use it as a dip with your favorite corn chips or toasted tortillas. Preheat oven to 375 degrees. 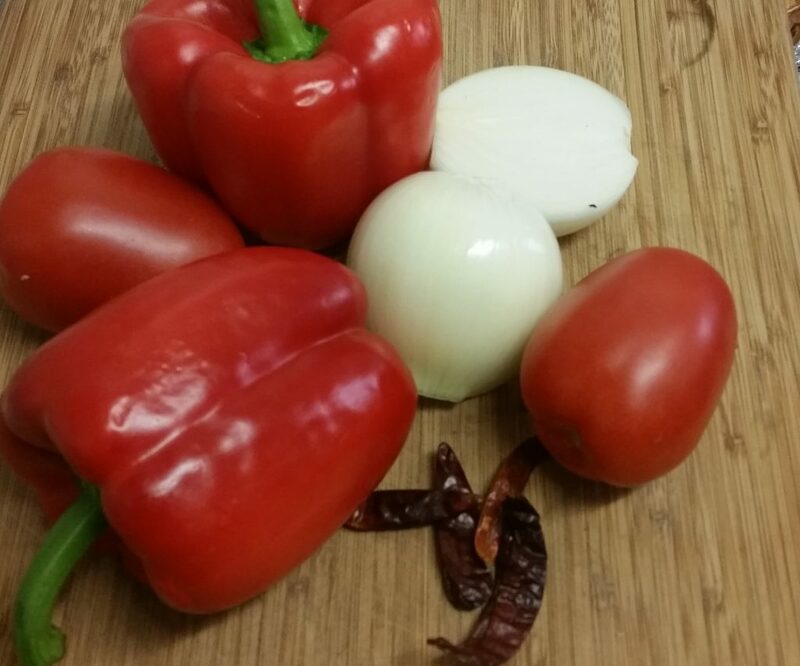 Add tomatoes, red pepper, onion, garlic and cayenne pods to a medium roast pan and toss with 1 teaspoon of olive oil. Cook for 1 hour, or until red pepper is soft. Peel and seed red pepper, discarding its peel and seeds. Add roasted veggies, water and salt to blender and blend smooth. Slowly drizzle in 2 tablespoons of olive oil while continuing to blend. Blend in the butter (or slowly drizzle in additional 3 tablespoons olive oil). Toss the cauliflower with 1 teaspoon olive oil in a large roast pan. Lightly season with salt. Cook in oven 20 minutes, or until cauliflower is slightly softened. Toss the cauliflower with about 1/2 of the Buffalo sauce. 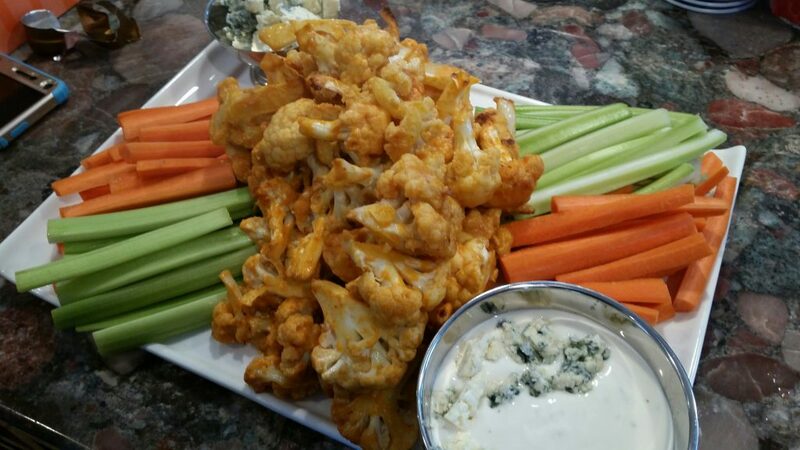 Roast the Buffalo Cauliflower another 15-20 minutes, or until cauliflower is al dente. 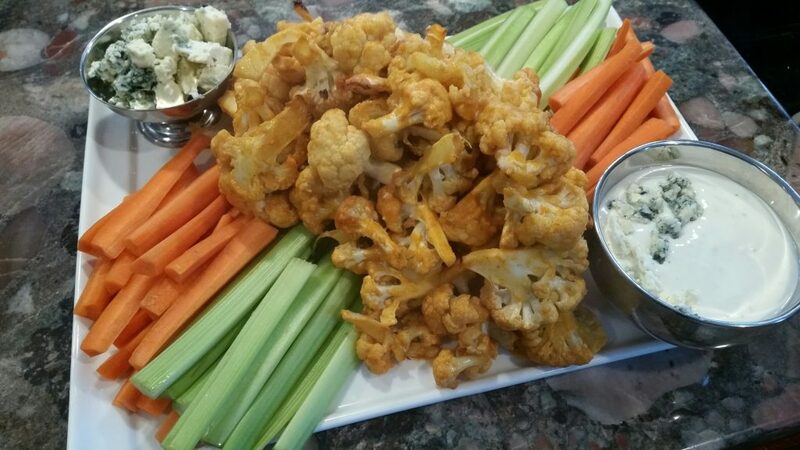 Serve alongside sliced, raw carrots and celery, plus blue cheese and/or blue cheese dressing.